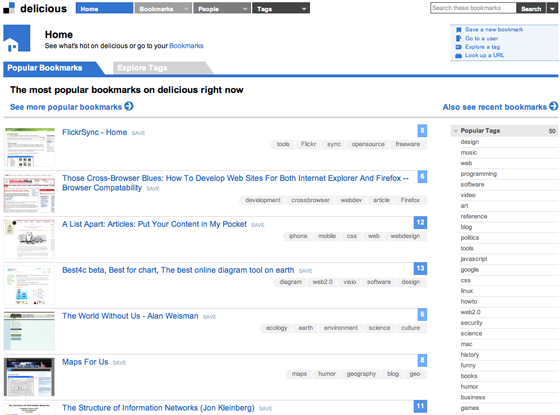 Social bookmarking site Delicious launched a limited, invite-only preview of version 2.0 of the service this afternoon. The new site can be accessed at preview.delicious.com, although only invited users can actually get in. The Delicious service (no longer “del.icio.us” and now residing at delicious.com) boasts 3 million registered users and 100 million unique URLs bookmarked. If you are invited, all of your existing bookmarks are imported to the preview, although any changes you make will be lost when the new service launches – so it’s just for trying out and giving feedback. Del.icio.us is saying that there is no guarantee that the final product will look exactly like the preview, since they are taking user feedback very seriously. The preview shows a substantially different interface than the current Del.icio.us site, and a number of new features. Founder Joshua Schachter says this is a complete code-rewrite of Del.icio.us. More details below. They weren’t kidding about a complete code re-write. And while the point of the new version is to release something far more scalable and agile than the existing product, there are a number of new features. Most of them were highly requested by users. I’m still working through many of them. There are a number of new sorting options. Instead of sorting bookmarks by how recent or popular they are, you can also sort alphabetically, and reverse sort any of the above. They have also added bulk tag editing (very much needed), and organization and sorting of your network of friends and people you watch. The preview also includes a new search engine that includes contextual search. 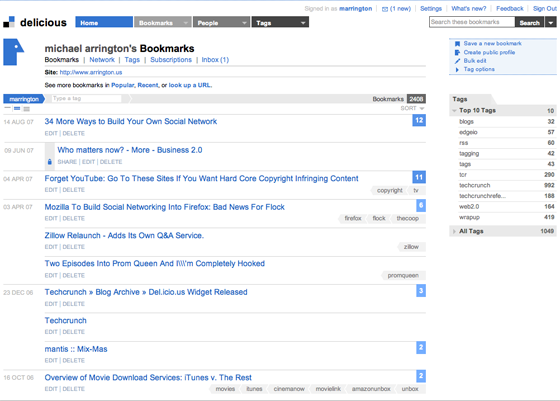 You can now search your own bookmarks, all bookmarks or just your network’s bookmarks. If you do not specify what you want, it searches whatever you are currently looking at – your own bookmarks, bookmarks from your network, etc. As I said, I’m still digesting most of the new features. Schachter says the new code base will allow them to make more frequent updates to the service. The navigation bar is now organized into Bookmarks, People, and Tags. 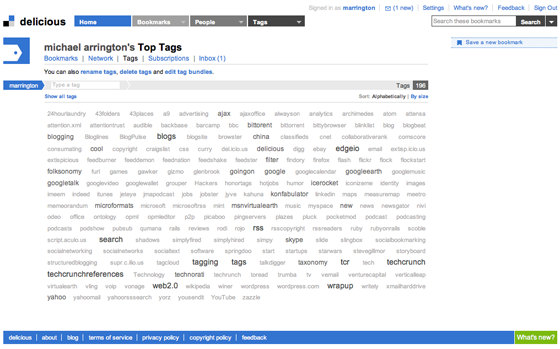 The tags section features a new MyTags page where you can see all of your tags in an expanded cloud. 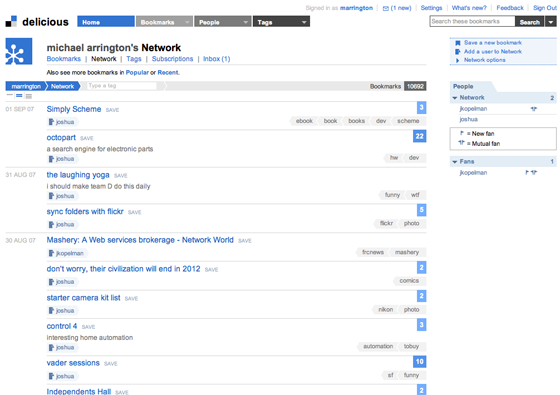 On the bar, you can search bookmarks amongst your own, networks, everyone’s, or the set you’re currently looking at. 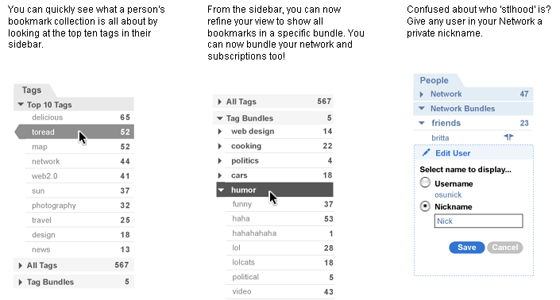 The tag bar features tagging auto complete and sorting alphabetically, by date, and popularity. The bookmark summary can adjust the view detail, so you can either get more or less info with a single click. Also, the popularity of a bookmark can be determined quickly by the width and shade of the blue box around the save count. In addition to a complete history of everyone’s bookmarks for that web page, you can now see who in your network has saved the page. 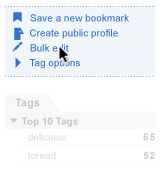 The side bar lets you easily see a person’s list of top tags. You can also refine your view of bookmarks to specific categories as well. You can also give members in your network nicknames. The action box provides you with a list of commonly used actions for the current page.